Discussion in 'New Members' started by Pat 13, Sep 22, 2010. Hi, new here just found this site and looks like I will be doing a little more reading. 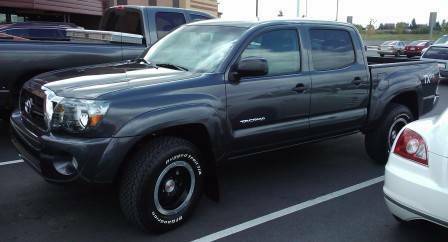 Just got a 2011 Tacoma double cab and it is the third new Toyota truck: 92, 02, 11. I got the new one because I needed 4X4 to get home in the winter, a little snow or ice and the 2X4 wouldn't make it up the steep hills. Welcome... is yours a TRD Off Road or Sport? Mine is my third Taco as well... 2001, 2005, 2010 all three were 4WD Off Road TRDs. I got the TX Pro, first 4X4. Just like this but dark gray. Wow, then you got it all! Beadlock wheels & performance exhaust... along with A-TRAC... nothing stopping you now... head on over to the western deserts and Baja California! Sweet! Welcome to TW! Post up some pics of your new ride when you get a chance! I live on a mountain at about 1300 ft so I get to use it everyday. Can't wait for the snow and ice. Nice truck. And welcome to TW. I like those wheels. Welcome from Southern Maryland! Nice truck. Like the wheels. Dammit all those wheels look good! Welcome to TW, nice truck.